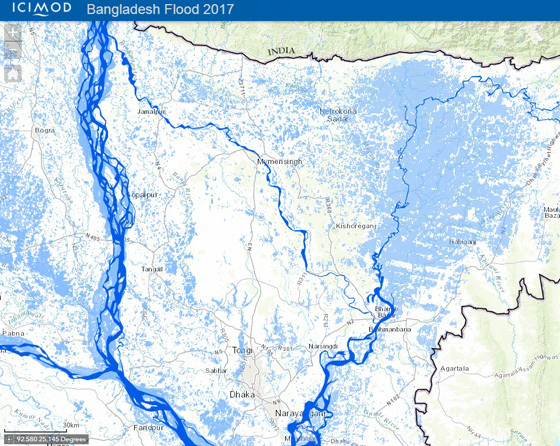 The International Centre for Integrated Mountain Development (ICIMOD) has prepared flood inundation maps in view of the floods and landslides that this year’s monsoon has triggered in Bangladesh. The maps have been prepared using Advanced Land Observing Satellite 2/ Phased Array L-band Synthetic Aperture Radar (ALOS-2/PALSAR) and Sentinel-1 satellite images made available by the Japan Aerospace Exploration Agency (JAXA) and the European Space Agency (ESA). Inundation maps for 24 and 29 June and 5 July 2017 have been made available using ArcGIS Online, a cloud-based mapping platform. The application will be updated with more inundation maps as new satellite data becomes available. 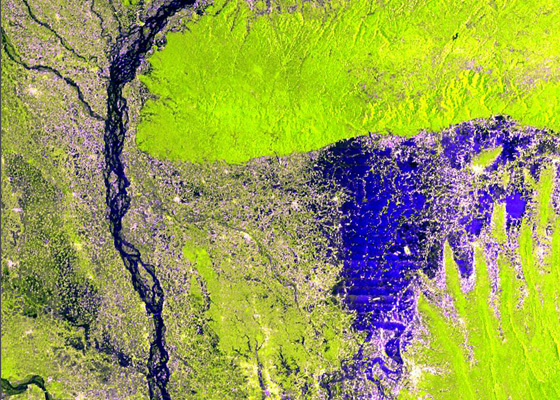 An ALOS PALSAR 2 image shows overall inundated areas in Bangladesh. The deep blue colour indicates inundated areas, while green and yellow coloured areas mark areas above water level. At ICIMOD, experts have resorted to using remote sensing data from active sensors to map floods, especially during monsoon season as they can observe data even during the regular presence of cloud cover. This mapping activity is part of the rapid response mapping activities at ICIMOD and is being made available under the framework of SERVIR Hindu Kush Himalaya (SERVIR-HKH). ICIMOD hosts the SERVIR-HKH hub and is part of a larger SERVIR network—a joint development initiative of the United States Agency for International Development (USAID) and the National Aeronautics and Space Administration (NASA).